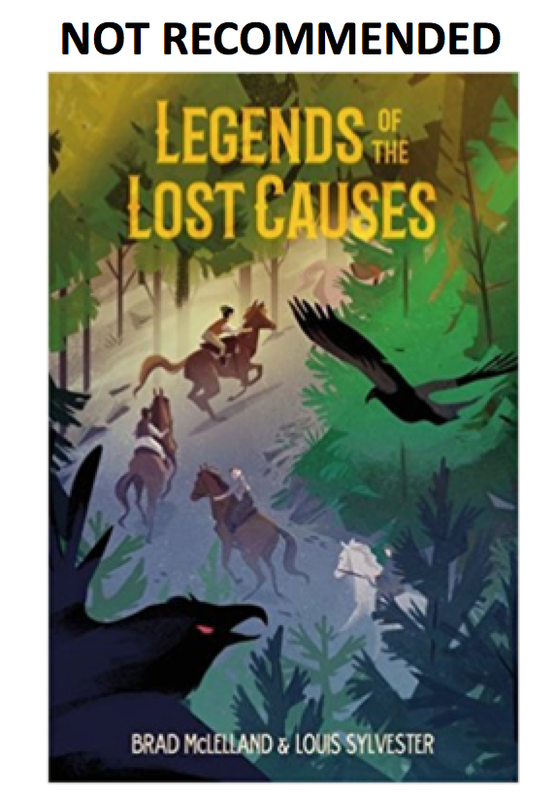 Legends of the Lost Causes, written by Brad McLelland and Louis Sylvester was released on Feb 20 of 2018 from Henry Holt (Macmillan). I read a NetGalley copy of it, and it is on my Not Recommended list. A band of orphan avengers. A cursed stone. A horde of zombie outlaws. This is Keech Blackwood’s new life after Bad Whiskey Nelson descends upon the Home for Lost Causes and burns it to the ground. With his home destroyed and his family lost, Keech will have to use the lessons he learned from Pa Abner to hunt down the powerful Char Stone. Luckily, he has the help of a ragtag team of orphans. Together, they’ll travel through treacherous forests, fight off the risen dead, and discover that they share mysterious bonds as they search for the legendary stone. Now it’s a race against the clock, because if Bad Whiskey finds the stone first…all is lost. But Keech and the other orphans won’t hesitate. Because they’re more than just heroes. 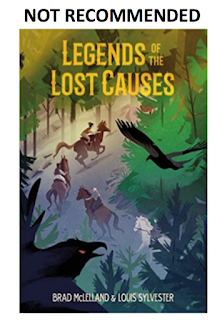 Legends of the Lost Causes marks the thrilling start to an action-packed middle grade series by debut authors Brad McLelland and Louis Sylvester. As you glean from the description, the main character is Keech Blackwood. He's an orphan, living with Pa Abner (who isn't what he seems). As we read this book, we learn that Keech is "half" Osage. The story is set in 1855 in Missouri. Macmillan (the publisher) has a page for the book that includes a blurb for Legends of the Lost Causes from the Wah-Zha-Zhi Cultural Center (that's part of the Osage Nation), which suggests someone there read the book. I wonder, though, if they were given the whole book? Or just the snippets about Osage culture? We don't know. I also wonder if anyone who is Abenaki (or who has expertise about Abenaki people) was asked to look over the Abenaki parts? Here's some of my questions for the authors--for all authors, in some ways--and some initial research findings. When will writers stop making up names like "Wolf" for Native characters who hunt? Do Osage people use that method for naming each other? Did the authors of Legends of the Lost Causes do some research on Osage naming? Why did McLelland and Sylvester use Abenaki words for the creatures who are raised from the dead? Where did McLelland and Sylvester get the Abenaki words ("gita-skog" in chapter 3; "tsi'noo" in chapter 7; "P'mola" in the Interlude) they used? The first hit for "gita-skog" is a site I do not recommend (Native Languages.org). Another one is to a horror movie with that title, made in 2015. I didn't find "P'mola" outside of this book. I gather the authors (via a character named Reverend Rose, a missionary amongst the Abenaki who did something to betray their trust) made it up. Is there--in fact--an oversized black bear (a monster) in Osage culture, called a "wasape"? Where did McLelland and Sylvester get the Osage words ("Zh-sape", "A tha no ko", "Shto be" and Wasape in chapter 18) they used? Some of those words, or words close to them in spelling are in Carolyn Quintero's Osage Dictionary but I don't know if her book is used by the Osage people in their language courses. I'll see what I can find out. I assume the authors wanted Granny to be realistic--with that realism being that she thinks Native people are heathens, but is it necessary for a good character (like Granny) to use derogatory words like "heathen" or even "uncivilized" in her remarks to any character? What is a "buffalo hair breechcloth"?! Keech finds a dead man wearing one and declares that the dead man, clad in that buffalo hair breechcloth, is Osage. When I do a search on an item and the only result is the book that item appears in... I think the author has made it up. Attributing it to a particular tribal nation, then, is really arrogant. Maybe I'm wrong. Maybe there is such a thing. If yes, please let me know in the comments and I'll come back up here and revisit this bullet item. The White man who took Keech in when his parents were killed is the one who "taught" him Osage culture, but the things Keech says and thinks throughout this book sound like a White Man's Indian (see Berkhofer's book of that title). By that, I mean, a Native character created from the imaginings of a White Man, based on "knowledge" gleaned from other White Men. In other words? Stereotypical. Whether bloodthirsty or romantic, they are wrong, and that's what I see in Legends of the Lost Causes. The use of Native languages, in the ways they are used in this book is also troubling, and the digging up of Native graves in chapter 26 and 27 is grotesque and utterly tone deaf (see NAGPRA, please!). The major review journals didn't pick up on any of these problems. The reviewer at School Library Journal said that the book "eliminates harmful stereotypes of Native populations." I disagree. The Bulletin of the Center for Children's Books called it an "easy read for fans of Westerns." That sentence ought to be revised to read "easy read for white fans of Westerns" or something like that. Yeah, I'm being a bit snarky, but clearly, there are problems in this book that reviewers are missing. Editors of these journals might consider steps they can take to help reviewers remember that Native kids read these books, too. In short, I do not recommend Legends of the Lost Causes by Brad McLelland and Louis Sylvester. Right away, we meet 13-year-old Keech Blackwood and his brother, Sam (who has a scar on the side of his face). Sam is doing a "champion's dance" after besting Keech on a game they play. Because Keech is Osage (we don't know that, yet), I wonder if the "champion's dance" is meant to signal that Keech is Osage? And, I wonder if the author's use of "champion's dance" is our first indicator that they don't know much about Native culture? I've not seen or heard of a "champion's dance" before--and am thinking that the authors heard or read about a victory dance (which is a real thing) and somehow that morphed into "champion's dance" in their heads? We also meet the character, "Bad Whiskey" when he comes upon the boys. They think he's creepy, Sam tells Keech they can run from him, and that he (Sam) is "the Rabbit" and can run fast. Whiskey asks if the boys remember the Alamo. Which one, he asks, is being Jim Bowie, and which one has "the awful job of playin' Santa Anna?" Keech thinks about how Davy Crockett is "their favorite hero of the Alamo." I'm wondering what the author's back story is for the boys making Davy Crockett their hero? We meet Granny Nell who gives Sam heck (calling him Samuel) for leaving his bible on the stairs. She says, "Samuel, we may live in a home built square in the center of nowhere, but that does not mean you can act like a heathen. You are twelve years old and can use a bookshelf like the rest of us civilized folk." As they approach, Pa tells them "Well, well, its the Wolf and the Rabbit, back from their adventure." My guess is that Keech's "Indian" name is Wolf. Pa wears a silver pendant that is "at the center of Keech's earliest memory. He'd been three years old and something terrible had happened to his real parents, but he couldn't remember what that memory was." What he does remember, is being in Pa Abner's arms when a "whirlwind of dust" flew about them. Keech felt a dry heat, and pressed his cheek into Pa, touching the pendant and feeling an icy chill pulsating from the pendant. Pa tells them that Whiskey is part of a gang that called itself the "Gita-skog, a name stolen from the Abenaki tribes up north. Means 'big snake' or some such." Why, I wonder did the author choose this name for this gang? The book is set after the battle at the Alamo, which was December 1835. Where is this particular plot point going to go? Pa tells the boys not to say their last name, Blackwood. When Whiskey arrives, he talks about spring of 1845, and that a decade has passed, so, this story is set in 1855. We learn that Pa was in the gang but left it and that he doesn't know what happened to the Char Stone, which is what Whiskey is after. Whiskey says he is the Gita-Skog. Pa rebuffs his claim. Whiskey is described in ways that make him seem not human. Pa takes Keech to his study, where the boys got weekly lessons on "the Native peoples, particularly the Osage, who had once inhabited the river lands south of the county. Having been close friends with important Osage leaders, Pa kept the study festooned with a veritable treasure trove of gifts and traded objects--a beaded vest of red, yellow, and blue; a pair of dress moccasins; a hand-carved box of sumac leaves and dried tobacco for smoking. It was here, in this room, that Keech and Sam had first learned how to make Osage parfleches from rawhide and how to speak the names of all the sacred animals of the forest." Pa tells Keech some history of the gang. It used to be called Enforcers, led by "Reverand Rose." He directed gang members to do bad things. Pa was in that gang and did bad things, but quit. Those who stayed loyal to the leader changed the name to Gita-Skog. The gang killed Keech and Sam's parents. Pa wants Keech and Sam to take a message to the telegram office in Big Timber, to be sent to someone named Embry. Pa gives them sandwiches, that they put into Sam's bag, which already has his bible in it. "Behold, I will send my messenger, and he shall prepare the way before me: and the Lord, whom ye seek, shall suddenly come to his temple, even the messenger of the covenant, whom ye delight in: behold, he shall come, saith the Lord of the hosts." "For yourselves know perfectly that the day of the Lord so cometh as a thief in the night." "Destruction cometh; and they shall seek peace, and there shall be none." They head to the telegram office but there's someone there, with a peg leg, who has destroyed the telegram machine. He is holding someone hostage, and the boys help end that situation. They also learn that someone has been destroying telegram machines everywhere. The man with a peg leg is shot, and they figure out that his name is Tommy Claymore and that he had already been killed a month before. There's been talk of this gang that can do unnatural things. As the boys return home, Keech sings "Ol' Lonesome Joe" to Sam. When the boys get home, they see that Whiskey and his gang are already there. They tie their horses to a tree where Keech had carved the head and face of a wolf (his favorite animal) into the bark and sneak closer to the house. Pa comes out of the house. A large crow lands on Whiskey's shoulder and seems to whisper to him. Whiskey tells Pa that the Reverend said he can't leave (Missouri) without the Char Stone and "all the sacred objects" and that he commands the "Tsi'noo" now. The Reverend also wants to know where the rest of the Enforcers are hiding. Pa ducks back into the house, the crow flies to and scratches the door, which Whiskey interprets as the signal for violence. He whistles. The whistle is a summons for "the thralls" to attack the house. They break down the door, and the boys watch Pa shoot one of them (named Cooper), but, he gets back up. Whiskey says "you know lead can't stop the Tsi'noo". When the man steps towards Pa again, they see him touch Cooper with the pendant, which turns Cooper into a lifeless corpse. But, Pa gets shot and they take the pendant from him. Keech decides to help. Keech is no match for Whiskey, the house is on fire, Pa won't tell Whiskey anything. Then, Whiskey points a gun at his head and Pa says he doesn't know where the Stone is, that "After the shoot-out at the Blackwood place, I had it hidden! It's lost, even from me." Keech flinches at hearing his last name and doesn't recall Pa ever talking about a shoot out. Pa says he thinks it is in a graveyard somewhere west, but doesn't recall where. A fight breaks out, Keech grabs the pendant and runs and looks back. Whiskey says "So long, Enforcer" and shoots Pa. He keeps running but hears Whiskey tell the others to "Get the shard." Keech puts it on as he runs and feels its "otherwordly chill" on his chest. He's able to hide from Whiskey's men. When he gets home, the house is a smoldering pile. Keech thinks his brother, Granny, and the others must have died in the fire. His plan is to find their remains and bury them, and then "because he was the Wolf, he would hunt." I wonder if the Osage consultant said ok to the authors giving the characters names like that. The P'mola, the Reverend Rose called them. A name derived from the Abenaki tribes who had once welcomed him into their villages--till the Reverend's lust for power betrayed their trust. The P'mola were his emissaries, the darkest of all creatures. Long ago, when the Reverend had awakened in the Palace of the Thunders, they were the first things he had created. You lost the amulet shard the crow said now. The words were not spoken aloud, but came to Whiskey as a terrible rasp--the Reverend's rasp--deep inside his head. Whiskey and his men are headed towards Whistler (a village) which is the location of the nearest graveyard. They're going on an "all but forgotten Indian buffalo trail." The P'mola (crow) tells him that he let a boy defeat him. The boy, the P'mola says, was raised by Isaiah Raines (AKA Pa Abner) and that he taught him "the ways of the Enforcer." Whiskey tries to say he's just a boy, but the P'mola says "You fool. The boy is Blackwood's won." Whiskey is taken aback and realizes that Keech is "the son of Screamin' Bill Blackwood." Whiskey says he needs more thralls, but the P'mola says "I gave you the Prime. I taught you the Black Verse. And you failed me." The P'mola says he's going to take the Prime from him, and Whiskey feels "the invisible essence that kept him whole, the force known only as the Prime, the darkest of all chaos magics" drain from him. He turns, blames one of the thralls for having let Keech escape, and because he has enough power left to remove the life force from one of the thralls, he does so. This chapter opens with a flashback to three years before. Keech remembers another lesson from Pa. He remembering being uneasy because he's not fully embraced "the warrior's way" that makes you fearless in combat, as well as Sam had. These training sessions start with Pa speaking this phrase "Now, my young warriors, let's begin." Awake, he starts digging in the smoldering remains of the house but realizes it is too hot and that he's got to find Whiskey and take vengeance on him, for his family. We learn that Sam is not his biological brother. He had been dropped off at the Home, later. Keech gets jumped by three boys who are also seeking vengeance. Turns out, Keech and one of the boys both want to kill Whiskey (who the other boy calls El Ojo). The town sheriff comes upon the boys. They've got Claymore (one of Whiskey's men) in shackles. The boys want to go with the Sheriff to track Whiskey, but the sheriff's group thinks the boys are not up to the task. Keech remembers the pendant and its powers and tells the sheriff that to catch a deadly snake (Whiskey) they'll need a predator who is not afraid of the snake's poison. Keech says "I am the Wolf. And with or without you, I'm gonna find this murderer, and lead him straight to the end of a rope." He doesn't tell them about the pendant. The sheriff and boys ride on together to Whistler, to find Whiskey. Keech wonders if he should tell them that Claymore isn't alive, that's he's a zombie (they don't use that word). The revelation is that the boys father was Noah Embry (Bennett Coal), who had been in the Embracer gang with Pa Abner. Claymore escapes. They set off to find him; Keech gets the pendant, puts it on and sets off on a different route than the others. Suddenly he feels an unnatural cold and realizes it is the pendant, which is also now glowing. Claymore is near, fails in his attempt to attack Keech, and says that "the Master" wants what Keech has. Cutter (one of the boys) comes upon Keech and Claymore and knocks him down. Cutter (Herrera) notices bullet holes in Claymore and asks why a man can still breathe, with holes in his heart. Keech tells him that Claymore is not a man, and that Whiskey had called him something like a "See-New" and that Keech thinks he is a thrall, which is a dead man raised from the grave, and commanded by Whiskey. Keech dangles the pendant in Claymore's face. He learns that Whiskey has left Whistler and that the Char Stone is "life". Claymore's expression changes and Keech sees that Whiskey has taken over his body. He calls Keech a pilgrim again (he did that when he first came upon Keech and Sam in chapter one). "Strong lip for a pup! I am the Gita-Skog, boy, the Big Snake that consumes all. I regret nothing." Whiskey says they are all going to die, and then, tendrils of dark smoke come from Claymore's nose, which means that the force that had made his body move, is gone. The sheriff finds them and they all head on, to Bone Ridge, or, the Withers graveyard. They cross a river that Keech says "the settlers" named Little Wild Boy. When they get to Whistler, the buildings are all on fire. In the middle of the street is a gazebo where townspeople are huddled. One calls out, speaking German, and they run away, thinking the sheriff/posse are more of Whiskey's gang. Keech decides it is time to tell them all he knows about the stone and that Claymore had called it "life." They go to the church graveyard where they figure Whiskey had probably dug into the graves to find the stone. Some graves are empty; Whiskey has raised some of the dead there, to replace Claymore and others he'd lost. They learn the nearby forest is called Floodwood and that the townspeople think it is cursed. They hear a monster there sometimes and nobody who goes in, ever comes out. Duck says something that pins blame for all of this on Keech's dad; Keech shoves Duck and then Keech and Nat get into a fight. Turns out that Duck is a girl. Whiskey's gang appears and attacks them. Keech heads into Floodwood, trying to escape. Two thralls (Scurvy and Bull) are chasing him but reluctant to go into Floodwood. In Floodwood, Keech hears an erie droning, constant. He falls asleep, wakes, and sees numbers painted on a stone. 40 7:7. He realizes why the place seems familiar; in his study, Pa had a painting of the red outcropping of the Floodwood. He realizes the numbers are from the bible. Then, Scurvy and Bull attack Keech. He knocks Scurvy (the smaller one) down, lets the pendant touch him, which returns him to the dead. Bull (the larger one) bears down, and Keech thinks it is time for him to be the Wolf. Keech figures out that the Floodwood gets people lost, walking in circles. He has the pouch Pa had given him, with pennies to pay to send the telegram. he uses the pennies to make a path. He lures Bull to a quicksand, knocks him into it. He realizes that the pendant is a beacon, letting the thralls find him. "Perhaps it was there, among those brilliant lights, that the souls of fallen braves encountered their next home, the hunting land where they found their spirits reunited with the lost warriors of old. The idea reminded Keech of his brothers." "... the dark of a lonely den. Other sparkling characters gathered around Pa, and they whispered to the tiny cub. Before Keech's eyes, the cub began to grow. It became the shape of a giant bear, a monstrous form, something that should not be." The group whispers "Wasape" -- Keech closes his eyes and opens them and its gone. He tries to sleep, then gets up and starts out again. He comes upon three thralls and hears Cutter and Duck's voices. The thralls hear them too; the boys take off together, chased by the thralls. Ask, and it shall be given to you. Seek, and ye shall find. Knock, and it shall be opened unto you. They climb the red mountain looking for a door; Whiskey's men catch up; Keech figures out Whiskey is also one of the dead, raised back to life, and that he's not doing well. The boys cause rocks to come loose on Whiskey's men. Duck tells them she's found the doorway. It looks like a rotten log but is really a woodworked door. Keech has the key (pendant). It opens into a cave. Cutter doesn't want to go in; he'd rather go back and make sure Whiskey is dead. They go into the dark cave. After awhile, Keech's pendant starts to glow. Duck gets her out. It glows too. She remember that they do that when Whiskey's magic is nearby. Then suddenly, they hear his voice. He and his gang are coming in, with torches. Cutter insists on going back to fight Whiskey and give the rest of them a chance to get away. They've all been aware of the smell of rot. A bundle of cloth lay around the corpse's legs--a pair of deerskin trouser sleeves and a buffalo-hair breechcloth covered in thick, dried blood. Beside the body lay a slender longbow. Slung over the corpse's shoulder was a quiver made from raccoon pelts. Tucked inside was a single dogwood arrow, its feathers white and brown. Keech studied the longbow and says the body was an Osage warrior, that the bow was made from the wood of a hedge apple tree, and that the breechcloth has Osage designs on it. That the "fella" had gotten lost in Floodwood and ended up in the case. Duck notes that the bony index finger is gesturing at the cave wall, to a picture painted in dried blood. Keech is filled with cold dread because it is Wasape. He tells them it was a bear that killed the man, and that it would have to be a mammoth one to take down "a skilled brave with a full quiver." They wonder where the bear is. They hear a gigantic road. Keech crouches at the skeleton's feet, says "If we ever meet on the spirit path, I'll be sure to give you proper thanks" and grabs the longbow and quiver, then joins the group as they try to find their way out of the cave. They come to a pillar with another bible number passage. Keech remembers it was one of Sam's favorites: "Except a man be born of water and of the Spirit, he cannot enter into the kingdom of God." The Wasape, Keech thought, remembering his dream in the evergreen ring. The Wasape contains the Floodwood curse! That's what Pa was doing in the vision. He and the Osage were putting a blight upon the bear and tying the creature to this area. The bear rampages in the cave, making it unstable. A falling piece of the ceiling knocks the pendant out of Keech's hand. He tries to find it, but they decide to leave by jumping into the river. Whiskey remembers a song from before the Gita-Skog, before the Reverend Rose. Around him, the other thrall are dead. "The orphan boy--the son of Screamin' Bill--had crushed the last of the Tsi'noo under rubble." The Prime (dark energy) that the Reverend had given him is almost gone. The bear is trapped under the fallen ceiling. Whiskey sees the pendant nearby, hears flapping wings and knows that one of the Reverend's P'mola has found him. It whispers the Reverend's words, that he is useless and that Ignatio and Big Ben will finish the hunt, but then, he gives Whiskey one more chance to get the Stone, by midnight. He feels the Prime flowing back into his limbs. The Reverend tells him to finish off the bear, that doing so will end the magic that holds him there in Floodwood. Whiskey uses the pendant to kill the bear, leaves the cave, and then uses his powers to bring Pa Abner back to life. The kids swim out of the river, and notice the buzzing and confusion of the woods are gone. They head for the Withers (the Sullied Place). Hundreds of graves... all marked with the same year of death: 1832. He stumbles on Abraham Nell, Granny's husband. On the stone is "WATCH THERE FORE FOR YE KNOW NOT WHAT HOUR YOUR LORD DOTH COME which is the 4th set of numbers from Pa's telegram. He figures out the numbers are coordinates. Pa appears, as a thrall. Whiskey mutters a chant and other thralls rise. He says "Tsi'noo, rise, and git to work!" Pa tells Keech to run to Duck, who is on Whiskey's horse and still has her pendant. The Tsi'noo start digging to find the stone. Whiskey has till midnight to find it. As they dig, Keech figures out where the stone is. Whiskey realizes Keech knows and instructs Pa to beat him till he says where it is, but Keech doesn't give it up. Whiskey tells him that his own father was Screamin' Bill Blackwood, terror of the West. When they had found the stone, Keech's dad led a revolt against the Reverend. Screaming Bill killed Whiskey, shooting him "straight in the eye with an arrow." ...the traces of a breechcloth and buckskin tunic, secured around the old bones with frayed cords. Upon the Enforcer's chest lay a lone tomahawk, the cracked wooden handle studded with brass and animal teeth, the iron blade degraded to black rust. There is no stone in that grave, so they dig up Keech's mother's grave. In her hands is a doll. Whiskey holds it and just then, the Reverend takes over his body. Pa Abner has a bit of life left and tells Keech that he took an Osage "Oath of Memory" that cleansed his mind of knowledge of where the stone is hidden. The Osage have a secret place that they call "Bonfire Crossing". I just can't anymore. Why do authors DO THIS? Aargh. Thank you for this very thorough review. I always check your site before I purchase anything with Native content for my library. Re: "a site I do not recommend (Native Languages.org)"
Debbie, could you elaborate on why you don't recommend this site? I couldn't find any other mentions of it on your blog, and in fact this is the source that recently provided translations of "Libraries Are For Everyone" in Hopi and Chickasaw, with consultation on the Ojibwe translation and more requests on the way, for use by the American Indian Library Association and others. The site's FAQ seems good to me, and it explains why translations should be done for pay; they also provided the translations at a reduced rate because their mission is to promote traditional languages. To determine a site's merit, I usually go right to its pages on my own nation and pueblo nations in general. Based on what I saw, I couldn't recommend it for Pueblo content. I remember when the call went out for people to help with the languages for the Libraries Are For Everyone pages. A good project, for sure. If I was a publisher or reviewer, the first thing I would do if presented with a book that has characters of color is check out the author. Who is this person? Does he/she have ANY connection with the situation described in the book? Two white guys writing about Native Americans? I would immediately be suspicious. Publishers are in the business of making money. Do you really think they are going to weigh 0.9% of the US population (from NCAI site) against a larger group with more purchasing power? It doesn't make financial sense if the publishers think the book will sell to focus on such a small group. I'm saying they shouldn't, but they probably won't. It's true that publishers are in the business of making money. But your conclusion -- that they are not going to care about accurate, non-stereotypical representations of Native people because of the relatively small population of Native people in the US -- is based on leaving out a key point. That is: good teachers and librarians care, whether they are Native or not. Many parents, grandparents, aunts & uncles (Native or not) care about being able to share books with kids that are free of stereotyping and other misinformation about Native people. Young people don't like to be lied to, and they too -- Native or not -- appreciate books and media that don't misinform them. So the market for accurate representations extends beyond the size of the Native population. Increasingly, reviewers of books for children (including this blog, Reading While White, De Colores, and similar resources) are aware of what's optimal and what's not, and will let the public know when a book presents mistaken ideas about Native people. Authors and illustrators who want to be known for accurate, thoughtful portrayals of all human beings, pay attention to the reviews and the comments of those who share books with kids. And a tiny number of publishers have it as their mission to produce and sell books that are created by & about Native people and people of color. And even the larger publishers are sometimes paying attention, especially if they have managed to hire principled and knowledgeable editors etc. It's not a landslide of awareness; more like a (sometimes glacially slow) ripple effect. But people, including publishers, are more aware of issues related to representations of Native Americans than they've been in the past. So this particular book may be about lost causes, but the work of this blog is not.